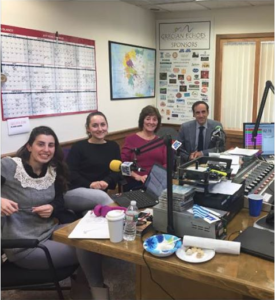 On Wednesday, November 15th, the Boston Lykeion Ellinidon was the featured topic on local Greek radio show Grecian Echoes. BLE President Irene Savas and Vice President for Administration Ilyana Sawka joined co-hosts Nikoleta Papadogianni and Stamatis Astra to introduce the organization and share its latest news. After a brief update on the dance troupe, Irene and Ilyana addressed the common misconception that the BLE focuses solely on dance performance and gave an overview of the organization’s six departments. The date of BLE’s signature annual event, Karnavali, was officially announced as February 10, 2018. Co-host Ted Demetriades closed the day’s program with a shout-out to all 20 current members of the dance troupe. Grecian Echoes is a variety show geared to the Greek-American community of New England. The format includes music, community announcements, dedications, and news from Greece. The popular show has been broadcasting for over 70 years, and airs on WNTN 1550 AM as well as online.